What frightens us, what unnerves us? What causes that delicious shiver of fear to travel the lengths of our spines? It seems the answer changes every year. Every year the bar is raised; the screw is tightened. 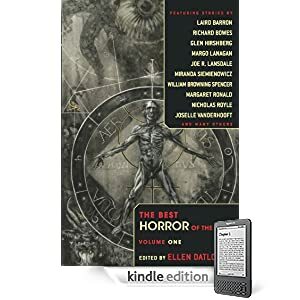 Ellen Datlow knows what scares us; the twenty-one stories and poems included in this anthology were chosen from magazines, webzines, anthologies, literary journals, and single author collections to represent the best horror of the year. Legendary editor Ellen Datlow (Poe: New Tales Inspired by Edgar Allan Poe), winner of multiple Hugo, Bram Stoker, and World Fantasy awards, joins Night Shade Books in presenting The Best Horror of the Year, Volume One. Or purchase The Best Horror of the Year: Volume One as a DRM-free e-book in the format of your choice through WebScription.net. Copyright © 2019 Night Shade Books.